Today in Dunwoody, unless you are "substantially" doing a re-build on a house, or are developing / building new property, or are in the defined stream buffer, you can clear-cut your entire yard of trees. Would you like your neighbors to do that? I'd like to see the City of Dunwoody enhance protection of ALL of our trees within the city limits. On Publicly -Owned property, the city has a "No Net Loss of Trees" policy. Meaning, they will replace & replant trees that are removed due to projects or other activities. As Milton Friedman would say, there's Neighbor Effects that impact us ALL when people clear-cut or indiscriminately remove trees. And those Neighbor Effects need to be "made whole" to the rest of us. Besides, we as a society can do better than that as we are being educated in really what living in a "Sustainable" fashion means. We've learned the hard way from the Europeans that came across to America and clear cut the land, thinking our natural resources had an infinite supply and who could care less about the impact of their activities on our ecosystem. And people seek to move to communities that demonstrate and value protections of our natural resources, clean water, and fresh air. Like water, trees are an asset for us all. They increase property values, provide shade & refuge and cool the temperatures around it. 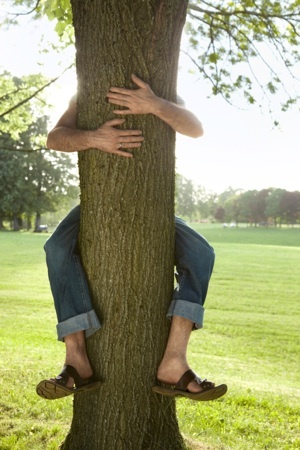 A healthy tree stores about 13 pounds of carbon annually, helping to cleaning the air -- that we ALL breathe. Let me know when US Congressman Tom Price's hometown of Roswell starts allowing what we can do here in Dunwoody. Let me know when his wife, Betty, who sits on the Roswell City Council submits a Text Amendment to allow clear-cutting of trees in Roswell. Then, we can have a conversation. Roswell is a conservative, established city and they DO protect ALL of their (specimen) trees within the city limits. Not just on city-owned property as we do here in Dunwoody. The Roswell Zoning Ordinance regulates the removal, transplantation and trimming of trees that may be impacted during land development and construction. It provides standards for tree preservation and mandates replacement of trees that may be removed during the development process. It also protects specimen trees – trees that qualify for special consideration due to their size, species or condition. And if you want to start talking about PROPERTY RIGHTS, then let me know when we'll start donating our land back to the Cherokee. For more about the protections of trees that are offered in Roswell, check out the link below.